Finally, here it is, the boxart for the abbreviated R&CF:ACIT. I, for one, was under the impression that ACIT was going to be purely DLC, like Quest for Booty was last year. But, all the better, as it can share a spot on the shelf next to Ratchet & Clank Future, the first R&C game I have ever bought, the reason why I'm buying it. Also, the release date is set in stone at October 27. However, all the news outlets are screaming "release date revealed!" Sorry, but the date was revealed not too long ago. Try a few weeks ago. Anyways, the big deal about this is more than just the box art and release date. Take a closer look at the top of the back. The first bullet point reads "Multiplayer." 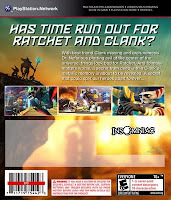 Ratchet fans will be quick to point out that the series has never had multiplayer. Sony posted an entry on their PlayStation Blog with the details, and was quick to remove the back of the box art from their blog, as well as their Flickr account. Remember, box art is pretty in "pending" until the game ships. 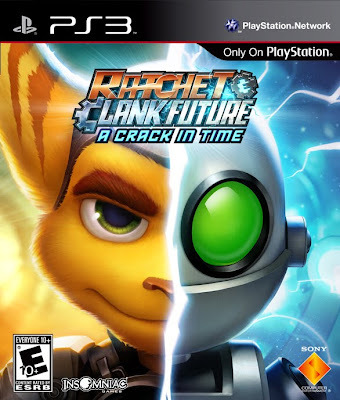 "As we've said before, [Ratchet & Clank Future: A Crack In Time] is a single-player game, and has been planned as such from the very beginning. We're totally focused on wrapping up the Ratchet & Clank Future story arc that we started in Tools of Destruction, and continued with Quest for Booty."